The Ballyneal Hunt Club features a unique 10-station sporting clays course which is delicately carved into the Chop Hills to provide a natural yet challenging test for shooters of all ages. While still on property, the course is located approximately one half mile north of the club house. This location suppresses the noise of gunfire and makes the shooter feel as if they have the Chop Hills to themselves. The typical shooter may choose to purchase a round of 50 clays, but the more serious sportsman usually opts for a round of 100 clays. It takes approximately 35 minutes to complete a round of 50 or 1 hour to complete a round of 100. 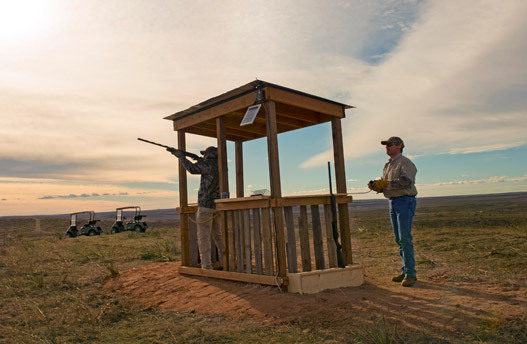 Our state-of-the-art clays facility is also home to one of the best 5-stand shooting ranges in Colorado. Boasting six distinctly different shots, our 5-stand provides hours of endless fun. As the starting point for all hunts, you can expect most throws to be reminiscent of true pheasant flight patterns during a hunt. Our professional guides are sportsmen at heart and are more than happy to provide shooting lessons. We encourage safety and proper etiquette at all times. If you are a beginner looking to improve or we feel that further gun education and safety is required, we will provide on-site instruction to increase your skill and knowledge. If you would like to schedule formal shooting lessons, please contact our team and schedule your instruction today. For further information regarding the sporting clays facility at Ballyneal Hunt Club, please contact our concierge team at (970) 854-5900 ext. 1. Surrounding communities are welcome, and reservations are strongly encouraged. Happy Hunting!